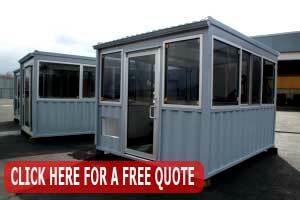 Within 5 business days, standard design quick ship prefab guard shacks can be shipped to your location. Take advantage of this opportunity now by contacting us prior to 4PM Eastern Standard Time and place your order. You will be able to choose between flex freight shipping and LTL. Quick shipping is possible with structures that feature standard construction options and colors. Standard design/build security booths are white, but there is a broad spectrum of custom colors that you can choose. Additional design features can be added to your buildings which include pass-through openings, custom windows, custom doors, and a range of finishes to protect the durability of your investment. Roofs can be built with hip, parapit, or awning designs. You can also choose brick or stone façade walls. Public address systems, special electrical components, and lightning protection are other customization options you can select. Standard structures also include one of 2 HVAC systems. The through the wall system is an Amana 9,300 BTU cooling and 11,000 BTU heating unit. The roof mounted system is a Coleman 13,500 BTU with 11,000 BTU heating unit. 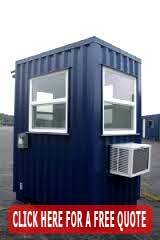 Quick ship prefab guard shacks have many features that offer comfort, utility, and amenity to the occupants. These features include such things as surface mounted fluorescent lighting fixtures and a load center for electrical wiring. We can also build structures with duplex switches, electrical receptacles, and data boxes. There are tempered and picture window options to choose from, and there are glass, metal, and combination glass and metal door options to select. 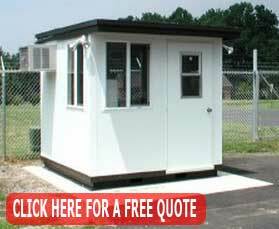 You can also have your guard booth customized as an elevated structure supported by a steel tower. Bullet proof and explosion resistant structures can also be built. Essentially, any level of customization you wish to explore is possible within the parameters of the structure’s dimension. 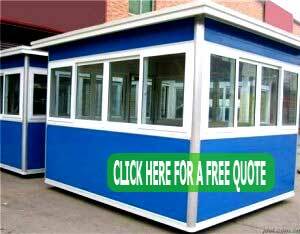 Quick ship prefab guard shacks offer any organization a rapid solution to the need for increased onsite security. Please be aware that customizing our standard build design may result in longer lead times due to the options and/or accessories you choose. However, these lead times will be determined in advance so you will know when to expect delivery.